What are weather stations and why do I need one? Weather stations collect information on the environment outside of your greenhouse. When discussing vents, the first thing to remember is no matter what automation solution you choose, ensure that you have a weather station. A weather station will help you monitor the outside temperature, humidity, solar levels and can also measure rain and wind direction. ThIs will be in conjunction with any sensors you have operating INSIDE of the greenhouse that will measure the microclimate. Install your external weather station in an accessible location. You’ll need to regularly clean it to ensure your readings are accurate, especially if you’re in an area prone to bird life, leaf fall or other external factors. Your data is only as good as your sensor so purchase a robust system that will last and give you accurate readings. Roof vents are a passive cooling method, utilizing the natural convection of hot air. Roof vents are one of the most efficient ways of cooling a structure, especially if you are in a temperate climate. Hot air rises to the top of the greenhouse and goes out the vent, drawing in the cool air underneath. An open roof structure is adjustable, opening the vent will allow you to keep the greenhouse cool whereas closing the vent will help you contain heat. Open roofs vents include open-panel, retractable-film, flat-roof, and low-profile systems. Bringing in the cooler outside air into the greenhouse during warm weather conditions is cost effective. Many growers have found this method helpful as it has shortened production time and produced better quality plants. Open roof vents will help you maintain desired temperature and humidity set points. An open structure roof will allow more natural light into the greenhouse. To resolve the issue of unwanted pests, place mesh screen covers around open areas however be aware that this will reduce the amount of air movement by up to 45% depending on the type of screen. Side vents can be utilized to protect the plants and will help increase the airflow within the greenhouse. If you have the plants in your greenhouse placed on a bench, you can simply roll up the side walls to the height of the bench and let the cool air flow underneath creating an ideal environment for the greenhouse plants. The use of side vents establishes this method to be cost-effective as the use of fans and electricity is reduced. Research (Santorini 2005, Wang 1999) has shown that the most effective vent configuration is a combination of roof and side vents, especially in warmer climates at low altitude. What is buoyancy driven ventilation? A buoyancy force is created by the difference between interior and exterior temperature which drives airflow. Warm air has a lower density and will rise above cold air – creating an upward air stream like a traditional fireplace. The ventilation system does not rely on wind and can take place on hot summer days. In comparison to wind, the buoyancy ventilation has a more stable airflow. Greater control in choosing areas of the air intake. Buoyancy ventilation relies on the difference in temperature outside and inside. Depending on the location of your greenhouse, air quality will be influenced by surrounding pollution. 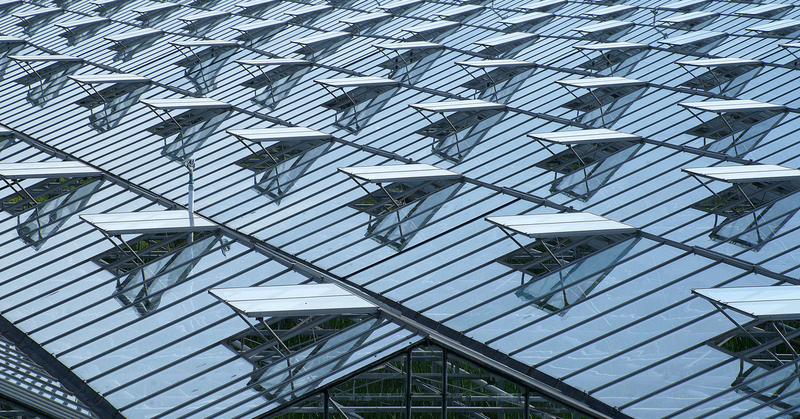 Buoyancy ventilation is influenced by the design of the greenhouse. What is wind driven ventilation? Wind effect is created by wind blowing outside the greenhouse creating a small pressure difference between the windward and sheltered side of the greenhouse allowing air to move towards the sheltered side. Wind-driven ventilation is most resourceful when the vents in the greenhouse are oriented to take advantage of the prevailing winds. However, the wind's effect is small if vents on the roof are not complemented with the side walls. The length and size of your greenhouse will impact the wind effect. What size should the roof vents and side vents be? American Society of Agricultural and Biological Engineers standards suggest that the area of the roof vent should equal the combined sidewall vent area, and each should be at least 15 to 20 percent of the floor area. Where should the vents be placed? Roof vents should be hinged on both sides of the ridge, while side vents are usually located at bench height. Why is the height of the greenhouse important? The taller the greenhouse, the easier it is to ventilate because of the increased buoyancy effect and ability for hot air to rise higher above the plants. NOTE: Depending on where your greenhouse is located you will also need to consider additional ventilation equipment such as vented exhaust fans to mitigate heat and humidity.